The Solent Waders and Brent Goose Strategy is a conservation partnership project, which aims to conserve the internationally important brent goose and wading bird populations within and around the Special Protection Areas and Ramsar wetlands of the Solent coast. The first Strategy was published in 2002 and focused on brent geese in the eastern Solent harbours; in 2010 a new Solent-wide Strategy was published, covering both wading birds and Brent Geese. A new strategy is currently being created and will be published in 2019. The new strategy is focussed on understanding bird movements from the SPA to inland sites and between inland sites. Three years of survey are planned, the results from the 2016-17 winter survey have been analysed and used to update the current use mapping. The mapping is available to view on the strategy, maps and data page. The new Strategy analyses all the existing data from the 2010 Strategy and the latest survey data. The new strategy also uses a different site classification system to previous years, which is explained in the interim project report which can be downloaded here. Accompanying the new classification system is new mitigation guidance which has also been produced by the Solent Waders and Brent Geese Steering Group, the new guidance is available to download here . The steering group members include Hampshire & Isle of Wight Wildlife Trust, Natural England, RSPB, Hampshire County Council and the Eastern Solent Coastal Partnership. Hampshire and Isle of Wight Wildlife Trust lead on the co-ordination of survey work and analysis of data. The current survey programme and recent data updates are being funded by the Hampshire Ornithological Society, the Environment Agency, the National Grid, HBIC, Natural England, the Solent Forum, the Local Planning Authorities for the New Forest, Southampton, Eastleigh, Gosport, Fareham, Portsmouth, Havant, and Chichester, Chichester Harbour Conservancy and the New Forest National Park Authority. The Solent Waders and Brent Geese Strategy has helped inform conservation efforts in other countries where Brent geese are also using inland sites. In Dublin bay, the pale-bellied population are also known to use golf courses, farmland and amenity areas, creating similar conservation challenges to those we face in the Solent. Scientific research into pale-bellied geese movements, migration and conservation is being carried out by the Irish Brent Goose Research Group. Find out more on their facebook page. In 2009, Portsmouth College developed an area of their playing fields. The grassland area was used by Brent geese and therefore mitigating for the loss of feeding areas was made a condition of their planning permission. The mitigation involved creating a Brent goose “refuge” an area of fenced-off grassland close to the area being lost. The refuge area was a success and post-mitigation monitoring has shown that geese continue to use the site. 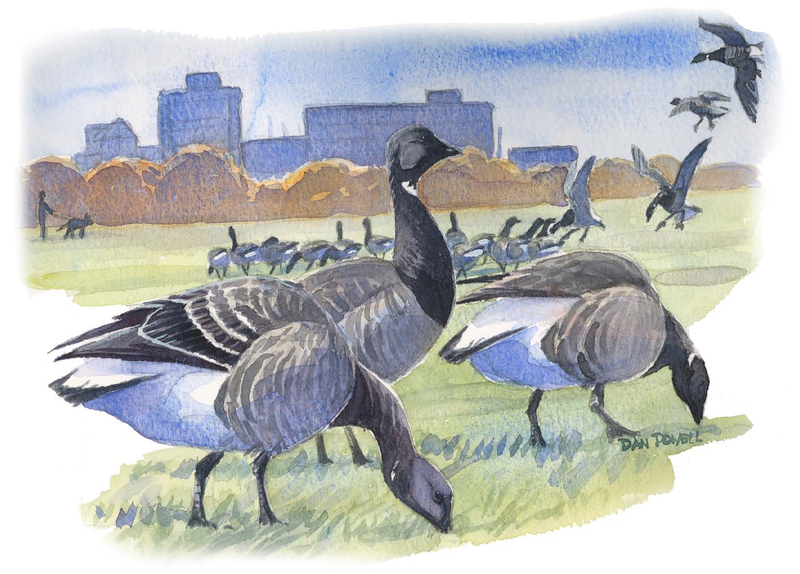 From the outputs of modelling exercise in the 2010 Strategy, we know that Brent geese like to feed on lush grassland habitats, prefer sites if they are close to similar sites they can also use, require clear sight and flight lines and sites that are close to the intertidal areas, and although they can habituate to some types of disturbance, they will be flushed from sites when the disturbance is direct. Our movement studies this year, will give us a greater understanding of how geese move between sites, which sites in the Solent are key usage sites, and identify where mitigation areas could be created.